This project consisted of fabricating a floating bulkhead in sections, designing and fabricating a temporary holding stand, welding and assembling the bulkhead on site, placing the bulkhead into the reservoir, and floating the bulkhead into place in front of the dam. The Tulsa District Corps of Engineers needed a bulkhead to block water in front of the spillway gates at the Keystone Dam on the Arkansas River to allow inspection and maintenance work on the gates. 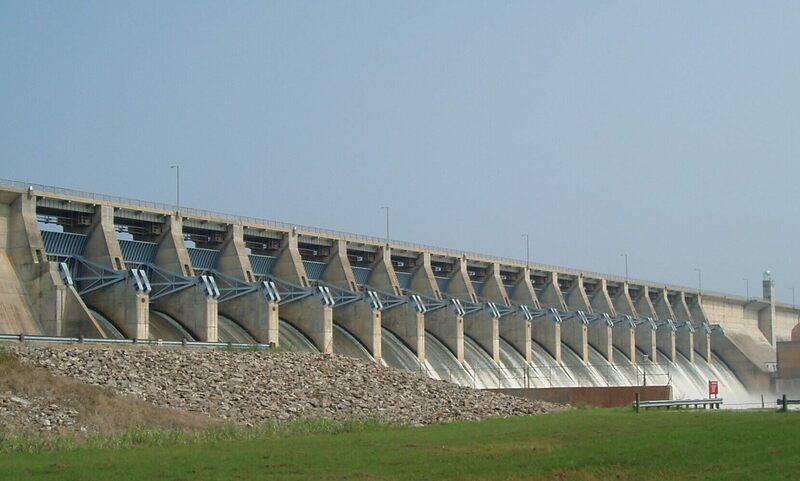 They designed a floating bulkhead to achieve their purposes, and Alltech Engineering was awarded the contract to construct, test, and install the bulkhead in its storage location on the face of the dam. The bulkhead was 49 feet long by 25 feet tall by 8 feet wide and weighed 170,000 pounds. It was fabricated in two main sections in Minnesota and shipped to the Keystone Dam for final assembly. There, Alltech designed and installed a holding stand with concrete foundations to hold the sections vertically for final assembly. The lower bulkhead section was first placed in the supports. Steel billets and concrete were then installed in the bottom of the bulkhead to provide floatation stability. The top section was then placed on the bottom half and the two sections were welded together. Pumps, ladders, bumpers and cathodic protection were installed and the whole unit was sandblasted and painted. Because of the size of the bulkhead, a critical lift plan was developed to hoist the bulkhead and place it in the water. The cranes (one 300 ton and one 200 ton) set the unit into the pool utilizing the buoyant effect of the water to assist the cranes in placing the bulkhead. The bulkhead was then towed by boat to the face of the dam where it successfully passed a series of tests. This project was awarded the Tulsa District’s “Eagle Eye” Safety Award.